A few jobs ago, I remember a Puerto Rican co-worker saying that she wanted to give her mother a plant for . . . some kind of event, I forget. Mother's Day, or a birthday, something like that. The problem was that she didn't think her mother was especially good with plants, so it needed to be something fairly low-maintenance. I forget what all we discussed, but I do remember suggesting a "spider plant" to her and being met with blank looks. A what? Oh, um, they're also called "airplane plants," they used to be really popular in the 70s, kinda grassy-looking, with a white stripe down the middle of the leaves, you know. They get little baby plants on runners? Oh, she said. No, I think that would just be weird. Why weird? What's weird about it? Well, she said, in Puerto Rico, they call that plant "mala madre," which translates as "bad mother." That might be awkward, as a gift for your mother. Guess so, yeah. I retract the suggestion. I never really found out why the plant is thought of as being a bad mother. I don't even know if the problem is supposed to be that it holds the baby plants too tightly to itself, or not tightly enough. Maybe it's something else entirely. So the whole thing is kind of weird for me to think about, but nevertheless, there it is. 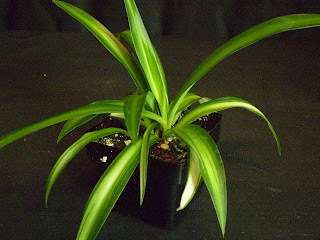 Chlorophytum comosum is a houseplant of fairly long standing; it's native to South African forest floors and has been kept as an indoor plant for decades. The wild plant is solid green; plants with white or yellow variegation are sports that have been kept going by propagating plantlets. Chlorophytum comosum can be perpetuated more or less indefinitely: the picture immediately above is of my husband's plant, originally a gift from his mother, which he has managed to keep going through seven generations. This seventh one has yet to produce any plantlets, which is unusual but not unheard of: sometimes they take a long time to do this. The growers' guide says that "plantlet production is distinctly photoperiod related," and claims that variegated varieties produce more plantlets during short days, while solid green varieties send out runners during long days. This might be correct, but I think there's got to be more to it than that, because my husband's plant has been around for a couple years now and hasn't made any runners at all yet, irrespective of day length. A different source says that bright light and long days will encourage offsets regardless of variety. Both say that "interrupting" the plant during the night by turning a light on it will encourage production of runners as well. I don't care enough to try this personally, but feel free. The reason for this is that hanging baskets permit the runners to hang over the edge of the pot, which creates a waterfall / cascade sort of effect that a lot of people like. Because of this, they're excellent plants to use when you want to block out an unpleasant view. Individual plantlets die from time to time, though infrequently: every so often I pick a couple out of the monster plants at work. Exposing plantlets to a lot of hot, dry air is a good, efficient way to kill them, if that's something you're into. To propagate, just pull off one of the plantlets (they come off pretty easily, which may be why I find dead ones on the monster hanging baskets from time to time) and stick it in dirt, or water. The only way they'll fail, as far as I can tell, is if you keep them in sopping wet soil, and even then it's pretty difficult to kill them: the best you can do usually is just kind of disappoint them a little. Plantlets will outgrow small pots in a matter of weeks, given good (bright, warm, humid) conditions, though they don't seem to mind terribly if they're potbound. Given even more time, however, the continuing growth of the roots will eventually push the whole root ball up and out of the pot, a phenomenon which also occurs with asparagus ferns (Asparagus setaceus, A. densiflorus 'Myersii' and A. densiflorus 'Sprengeri') and occasionally with Sansevieria trifasciata, though it's faster for Asparagus and slower for Sansevieria. There are not actually all that many things that can go wrong with Chlorophytum comosum, as befits the extremely low difficulty level above. What problems do exist tend to be cosmetic, rather than potentially lethal. The most common is tip burn: the tips of the leaves turn black and begin to die back towards the center of the plant. There are a number of factors which contribute to this, but generally the problem is that the soil has built up a level of fluoride, sodium, or boron which is harmful to the plant. Extreme heat (prolonged exposure to temperatures above 90ºF) can also result in tip burn. According to a few sources, including my growers' guide, the specific substance causing the burn can be determined from its appearance: sodium causes black tips, boron causes tan or gray tips, and fluoride causes reddish tips. (High temperature or excessive light is said to lead to light gray or yellowish patches, not necessarily at the leaf tips, though the plants we've moved closer to a heat source at work have mostly just gotten black tips, in those cases where there was a reaction.) Excess sodium is probably from softened water; excess boron is probably from overfertilization; excess fluoride is probably from overfertilization or too much perlite in the soil,2 though in a few cases the water may just contain a lot of fluoride naturally and you have no choice but to switch to bottled, distilled, or reverse-osmosis water. In any of these cases, flushing the soil heavily and thoroughly with regular tap water isn't going to hurt anything, and may help the plant a little bit in the short term. If you are not watering your plants until water runs through the bottom of the pot and then discarding the water that runs through, or if (worse!) you are using a pot without drainage holes, you're going to build minerals up in the pot to the point where tip burn of some kind or another is more or less inevitable. 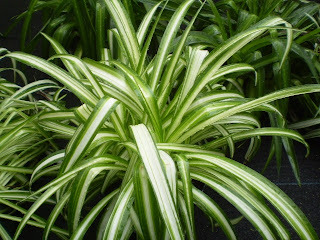 Chlorophytum comosum are also "heavy breathers," for lack of a better term. This means that they are said to be very good at removing chemicals from the air,3 and the NASA study that showed that plants could clean air was particularly effusive on the advantages of Chlorophytum comosum. The down side to this is that they also breathe deeply of stuff that can harm them, including ethylene (a very small component of natural gas, and also a plant hormone released through a variety of processes; click the link for details), certain insecticides (notably chlorpyriphos), and bleach (which is probably the most relevant chemical for our purposes, since it's the one you're most likely to use around the plant). The solution? Try not to use bleach, or the certain insecticides, near the plant, and if you must, then provide good ventilation. Diseases and pests, on the other hand, are not usually a problem. Mealybugs (including the dread root mealybug) and scale are specifically mentioned here and there, as are caterpillars, though caterpillars aren't likely to be problems inside, and mealybugs and scale don't seem to be common problems. In the event that you have mealybugs or scale, my recommendation would be that you just take a plantlet off and start over, but if you really want to try to save the parent plant, I'd skip the rubbing-alcohol step and go directly to the systemic insecticide, whether this be imidacloprid or something else. The growers' guide recommends bendiocarb, S-kinoprene, or acephate, though I couldn't promise you that these are available for home use. This might all sound pretty bad (tip burn! chemical sensitivity! ), but if this is the worst you got, you have a pretty easy plant on your hands. Honest. Light levels can range from filtered sun down to moderate (light that's too low will slow or stop new growth, and leaves will droop noticeably). Watering is also flexible: the roots can store a lot of water to get a plant through a drought, and plants can also roll with a wet spell, though neither extreme is tolerated indefinitely. Humidity is essentially a non-issue, though extremely dry air may bring on or accelerate tip burn. Feeding should be minimal to nonexistent: they don't need much in the first place, and too much will just cause problems, especially if your fertilizer preparation includes boron. Chlorophytum comosum will not survive really cold temperatures, but it can go down to just above freezing before it's actually damaged, and it actually can freeze and then come back in spring, I'm told, so cold isn't a huge issue. (Not that the plant is any happier to almost die and then struggle back than you would be: I'm not recommending leaving your plants outside in the winter if they're going to freeze.) I expected to find that it was an invasive species somewhere, just because the runners and rapid growth rate seem custom-made for invasiveness, but it really hasn't been an enormous problem anywhere as far as I could find, though it has established itself in a few Pacific islands. So, what kind of mother is it really? Well, I couldn't say exactly, though overworked seems like a reasonable adjective for any plant that has this many children. And where is the father? Hmmm? Photo credits: first hanging basket (a 'Bonnie'): anonymous donation from a Garden Webber. Others: my own. 1 The scientific name isn't much of an improvement either; it translates more or less as "long-haired green plant." But that's still better than "bad mother." 2 Some minerals naturally also contain a lot of fluoride, including perlite and some phosphates. This is normally benign, but soil mixes containing a lot of perlite, or fertilizers with high phosphorous content (phosphorous is the middle number on the package: a fertilizer labeled 10-20-10 is a high-P fertilizer), may incidentally contain enough fluoride to cause a problem for sensitive plants. 3 I say "said to be" because I'm not quite sure I buy into the whole plants-as-removers-of-toxic-chemicals hype. I mean, I believe that they can absorb a lot of chemicals: benzene, trichloroethylene, formaldehyde, etc. I just question whether most people, under most circumstances, would be affected by the levels of the chemicals in question anyway, i.e., whether it matters that these plants are able to do this. That said, it's certainly not going to hurt you if they do take chemicals out of the air, and plants are nice for lots of other reasons, so whatever (see my longer essay on the subject here). I just worry that concern about vague environmental "toxins" is causing us to lose perspective about which things are actually dangerous. My grandmother smoked herself into emphysema, but was phobic about microwaves because she read somewhere that they destroy nutrients, and she was adamant about not destroying nutrients. (Microwaves do destroy nutrients. So does heating them on the stove. So does exposing them to oxygen.) I can't complain too much, since I got a microwave as a result (her children bought her one because she was getting to the point of being too weak to cook for herself, as the result of the emphysema and related medical issues, so she wasn't eating – seriously, she weighed like 70-80 pounds when she died. But she wouldn't take the microwave, so they wound up taking it back, and somehow I ended up with it. Which was nice, because I had just moved, and kind of needed one. ), but if she'd been as scared of smoking as she'd been of microwaves, she'd probably still be alive. Not to mention the convoluted logic of not eating any nutrients because you don't want to lose a fraction of them by cooking them in the microwave. So are there dangerous chemicals out there? Sure. Are some of them in your home? No doubt. Are you breathing them in right this minute? Odds are. Are said chemicals going to be what kills you? I'd be surprised. Gee thanks.....I thought there only four types of chlorophytum (the all green, the curly, and the 2 margined ones), now I come to find out there are more....and I am already hunting for the curly. Wonderful post! Great post! After reading this post I went out and purchased a 'Hawaiian' and it looks like it's going to be a wonderful plant. How old is the chlorophytum that is in the last picture? Not sure on the age; it's been there since I started, and most likely for a few years before that, but I don't think there's any way for me to find out. It's oldish, obviously: they can grow fast, but not that fast. I really favour these plants, and always have to have a few hanging around the house. I wonder if it has anything to do with spending my early years in the 70s when they were extremely popular - in macramé hanging baskets, of all things. Are any visitors to this site old enough to remember those? Now back to my chlorophytum... as I said, it is doing great, but there is one section of it that, how do I say, has started to fall over the edge of the pot. The "stem" or base of that section of the plant is almost like a snake... what do I do about that? Can I cut it off and put it back in the soil, to cover the 4 inch "stem", or should I root it in water prior to putting it back in the pot? Or, do you just let those that want to hang, hang? I don't know that it matters all that much: they'll usually root easily enough that it doesn't matter how you try it. I sort of prefer water-rooting, just because it's easier to see what's going on, whether progress is happening, etc., but it should also root fine if you just break off the stem and cover it with soil. It'd also be fine just hanging, I'm sure. Thanks a lot. Those pictures are really wonderful while the words are very helpful! Thanks again and Wish you a Happy Chinese Year Year! Great post! I have some plain green plantlets that are doing very well in water. I am wondering if I can just keep them in water or will I have to transfer them to soil? I have read that water roots are different than soil roots and I don't want them to die or burn in the process. Should I leave them as is until full maturity? I expect that if the water is changed regularly, you can probably keep the plantlets going in water more or less indefinitely. You may want to give them a tiny, tiny amount of fertilizer every once in a while, if growth slows down or the new growth is yellowish or something, but I think it they can be grown for a very long time, if not forever, in water so long as it's kept fresh. Water roots are different from soil roots, but spider plants are usually so robust that I don't think it matters. If you plan to have them in soil eventually, I would go ahead and transplant them sooner rather than later, because I don't think you really gain anything by having them in water. If you don't necessarily ever want them in soil, then you shouldn't have to move them. Thank-you so much! Does the same answer apply to Tradescantia zebrina? More or less. I think Tradescantia zebrina probably has higher requirements for nutrients, so maybe a little more fertilizer, slightly more often, but they can at least be grown in water for quite a long time, if not forever. You are awesome! I really think you should write a book. I'll buy it!!!!! I have to ask you about your post regarding keeping the water fresh. I noticed that you stressed this. with my little green plantlets that I was given by a generous florist who snapped them off a huge mother plant, I've noticed they were thriving for a while and even produced their own stolons. In time though, I noticed a bit of rot forming at the base of some outer leaves in the center of the plant. I quickly transferred them to soil out of fear (fingers crossed). Is this because the water was not fresh enough? After a while a green film forms on the water roots. Perhaps that is fertilizer buildup in the water but even if I change the water often it seems to happen with all plants. Is this flouride, sodium or boron buildup? Most likely it didn't mean anything. 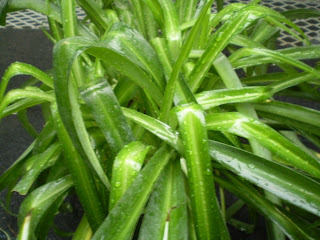 If a plant in water loses a lower leaf, which any plant will given enough time, the leaf will start to rot. While it's not good to leave a plant in that situation (the microorganisms that break down the dead leaf require oxygen, leaving less oxygen available to the plant's roots, which need it too), it won't necessarily hurt the plant. The green film, too, is either natural for the plant or it's algae, and either way it's not going to make much of a difference. The reason for emphasizing keeping the water fresh and changed was because any minerals in the water (either there when it comes out of the tap, or added in the form of fertilizer later) will become more concentrated as water evaporates, and the more concentrated it gets, the more likely you are to have burnt tips and stuff. They're extremely tough plants, so most of the suggestions here are not so much about keeping them alive (which is pretty easy) but keeping them looking good (which is slightly harder). It's called 'mala madre' because she throws her babies out of the pot! I'm not quite sure if my zone is 10a or 9b, but in my yard, Chlorophytum comosum is a noxious and invasive weed. I used to like it until I had it all over my yard and couldn't get rid of it. 1) Yes, we too had the 70s baskets and spider plant. 2) Mala madre? :Not only does she throw her babies out of the pot, but she keeps them attached to her--a little bit dysfunctional. 3) Buena madre: Really, overworked is the first thing I thought, too. 4) Thanks for writing such a fun and funny and informational blog. Bravo. I am in zone 8b, AL/FL border and the plain green plant is absolutely an invasive perennial here also. It "walks" through the flower bed in shade or sun in a larger circle every year. I remember the macramé hangers too! I've been finding that spider plant stems work surprisingly well in reverse. Thanks to this property, I am able to cut off spider plantlets in small groups with the stem still bridging them together, and then expect the stem to remain intact as the plants use it to share resources with one another. This effectively turns a group of smaller plantlets sharing the same stem into one bigger plantlet, which can be useful in promoting root growth. "THE POTTED-PLANT MICROCOSM SUBSTANTIALLY REDUCES INDOOR AIR VOC POLLUTION: II. LABORATORY STUDY" is a white paper study of air quality in office environments. I found it interesting that it is the relationship of plant, water, soil and microbes that clean the air. Surprisingly, it states, "These studies included numerous trials in which VOC (volatile organic compounds) removal activity was sustained for up to seven days after the plants had been removed and the potting mix returned to the test chambers. Similarly, when unused (‘virgin’) potting mix was watered normally, and then challenged, moderate levels of VOC removal activity were induced by the initial dose, but in this case, after six days, activity began to decline. No absorption was recorded in the presence of empty pots alone, or a tray of water to provide a possible VOC sink." The same microbes which feed, feed off of, and, in some cases, protect the plants roots, break down the chemicals that tend to be trapped and accumulate in the indoor environment. There is plenty of info available online and in book form supporting this. Walk into a carpeting store and take a few deep breaths through your nose to get a feel for what formaldehyde, benzene, xylene, and alcohols do to your sinuses. Anyway, the more I learn, the more I love plants. Just want to say I loooove this blog. My boyfriend has turned me on to indoor gardening, so when I moved this summer I decided to figure out how my cats and plants can co-exist. I have NE facing windows, so I rely on supplemental lights from CFLs . . . and so far so good. My spider plant has been a bit of a bother. It's been struggling a bit--probably because I have been overwatering (I am learning how to water properly) and I started using distilled water on it hoping that it may help with the leaf burn. I've had too many yellow leaves I've had to cut off. I am hoping that it'll bounce back. My marantas (which are not easy) and ferns are doing better. Don't you think the name "mala madre" simply derives from the fact the "mother" plant ejects her offspring from the basket? I had an acquaintance of Puerto Rican descent who told me about this years ago and I loved it, thought it was hilariously appropriate. I went to a florist for my wedding preparations and she said the name in Puerto Rico comes from a mother throwing out her baby by accident with the bath water. 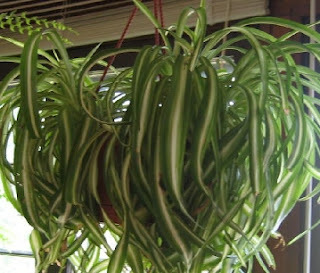 I recently ordered a solid-green spider plant (impossible to find in garden centers here). The seller said it would fit nicely in a 12 inch basket. When I received it, the plant fit perfectly in a 6 inch pot. So I planted it in an 8 inch pot with fresh potting soil. Is this the right way to handle this plant? They like to be a bit root bound, right? Or should I go ahead and repot it in the larger basket? Thanks for your advice! 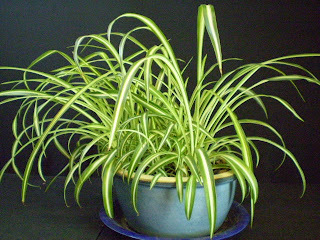 Ordinarily, if someone asked me what to repot a spider plant into from a 6-inch pot, I'd say an 8-inch pot, just because that's generally the way repotting works. Most plants don't handle jumps to a much larger container well. 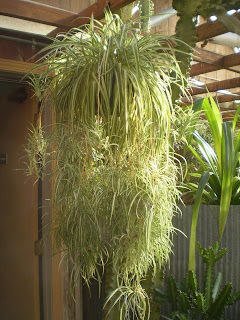 That said, some plants are a lot more flexible about it than others, and spider plants are one of the flexible ones. So I don't think the advice you got was necessarily bad, but I don't think what you actually did was bad either. The roots grow fast, so your plant will wind up being potbound pretty quickly, but that's not necessarily a problem for the plant. I don't think they necessarily prefer to be potbound, but it shouldn't hurt anything either. I have two spider plants that have been doing really badly and thanks to your wonderful information above, I am going to repot them with almost no perlite and see if that makes a difference since I've done everything else you suggested with other spiders. These new varigates are so difficult for me. The one with the white on the outside is just hanging on for dear life and all that perlite could just be the killer. I love you and have loved you for years. This is the best most readable and comprehensive write-up on spider plants I have found after an eternity of rifling through page after website page. Mr Subjunctive, please stop underestimating yourself: I have been enjoying reading on plants on Google for years and you are a class apart! Write a book that talks plants in the distinctive style that you have of talking plants, it might be the equivalent of Linda Goodman's Sun Signs. Trust this Indian's judgement on that! I am not sure if this is exactly the plant but my mother also had a plant of mala Madre. The reason we called it that want because it wouldn't reproduce but because it is said that if you drink a tea made from the plant of mala madre and you are pregnant then you will lose your child. My mom would give it to me during my period so that it would go quicker.